Delightful little dish printed in a steely blue, which we believe to be part of a set. No backstamp. Crazed with a little discolouration underneath otherwise excellent condition. Delightful little dish with pattern on the inside only. Backstamp: Est 1657 Adams Cattle Scenery W Adams & Co Ironstone. Excellent condition. Fabulous dish printed in a light steely blue. Backstamp: Crown Semi Porcelain W Adams & Co England. Underneath there is a little wear to the foot rim otherwise excellent condition. Pretty little dish in the shape of a leaf. Backstamp: Rd No 623294 This Pattern was introduced by William Adams in 1780 being a copy of a Chinese pattern & one of the first of its style produced in English pottery. Wm Adams England. Light all over crazing with a little smudging of the pattern around the inside rim and a tiny tiny nick to the rim. Delightful little pot with same Bird cartouche either side of the body. Backstamp: Chinese Bird Rd No 623294 Adams Made in England Real English Ironstone Established 1657. Excellent condition. This is a most unusual piece. It was made specifically as a lamp, but using the mould for the canister. Often lamps are found to be converted vases or ginger jars. At some time a more modern fixing has replaced the original one which has resulted in some damage to the neck. This however is fairly minor because once a shade is in place it will be hidden. Blue printed backstamp: "Wm Adams England. Rd No. 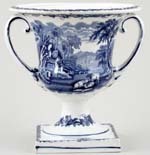 623294 This pattern was introduced by William Adams in 1780 being a copy of a Chinese pattern and one of the first of its style produced in English Pottery" Although fitted with a lamp holder and flex, this item is sold for decorative use only, and must be checked by a competent electrician before being used as a lamp. A very pretty little dish with pattern on the inside only. Backstamp: Rd No 623294 This Pattern was introduced by William Adams in 1780 being a copy of a Chinese pattern and one of the first of its style produced in English pottery Wm Adams. Excellent condition. Delightful little dish with side handle. Backstamp: Rd No 623294 This Pattern was introduced by William Adams in 1780 being a copy of a Chinese pattern & one of the first of its style produced in English pottery. Wm Adams. Light all over crazing and a little thin glaze here and there which gives the blue a tinge of green. Overall excellent condition. A very pretty little dish with gently serrated edges and on the underside the veined appearance of a leaf. Backstamp: Rd No 623294 This Pattern was introduced by William Adams in 1780 being a copy of a Chinese pattern & one of the first of its style produced in English pottery. Wm Adams England. A very pretty little dish with gently serrated edges and on the underside the veined appearance of a leaf. A couple of minor blemishes, otherwise excellent condition. Small round box with pretty floral border and rural scene to the cover presented in its original box complete with original insert of the history of William Adams and wrapped in Wedgwood tissue paper. Backstamp: Adams Made in England Real English Ironstone Established 1657. Excellent condition. This is an absolutely fabulous piece, richly decorated and with moulded side handles. 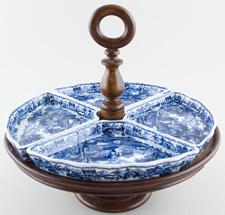 Originally made as a stand for the fabulous Adams octagonal bowl but is a lovely piece on its own. Backstamp: Kyber W Adam & Co England. Crazed otherwise excellent condition. Gorgeous covered cup in this lovely floral pattern. No backstamp, but attributed to Benjamin Adams of Greengates Pottery, Tunstall. There are some minor nibbles to the inner rim of the cover, just a hint of discolouration on top of the cover and a touch of wear to the handle but overall excellent condition. Beautiful little dish in the shape of a leaf with veined appearance on the back. Backstamp: Impressed Adams Tunstall. Light all over crazing with a small glazing blemish and minor pooling of the glaze to the rim otherwise excellent condition. Lovely piece of bright and clean early pearlware. A couple of small rubs to the rim and few signs of age, otherwise in excellent condition. Impressed backstamp B Adams for Benjamin Adams of Tunstall, Staffordshire, who was in business from 1809 to 1820. A boxed set of 15 paper napkins and two candles. They show a few signs of age, but the napkins have never been used although 5 missing as the box states 20 napkins, and candles never lit. Part of the internal fixing in the box is missing and the lid has a little damage, but a set. Provenance: The Entwistle Collection. With gilt. A delightful little piece printed in a soft blue. Backstamp: A & S Stoke On Trent Arcadian and impressed date for 1934. Excellent condition. It may be a little fanciful to imagine this was for gooseberries but it is made to be robust and has an indented neck for securing a covering. Clearly designed for storing or preserving a fruit or vegetable. Backstamp Ashworth Bros Hanley and inscribed in the clay Ashworth 1914 A little minor discolouration underneath otherwise excellent condition. A lovely tray made of tin, not ceramic, with deep canted scalloped sides. Backstamp: Baret Ware Made in England To Clean Simply Wipe with Damp Cloth. Some surface scratching and the occasional minor blemish. Pretty little dish in the shape of a flounder. Backstamp: Staffordshire Warranted Stone China B W & B. There are a couple of small rubs and a little wear to the rim and light all over crazing with a touch of minor discolouration. Gorgeous little plate in an unusual shape. Backstamp: Bisto England Rd No 732553 and some with impressed date for late 1920s. Touch of crazing and there are some small blue blobs of ink. With Gilt. Gorgeous little dish. Backstamp: Bisto England Rd No 732553 and impressed date for 1929. A little wear to the gilt and on the back a small manufacturing blemish, otherwise excellent condition. With gilt. A stunning dish with gilt highlights to the rich cobalt blue handle and gilt spatter decoration to the embossed rim and around the luscious floral pattern. Backstamp: Dudley Bisto England and in script B1381. Excellent condition. Bone china with gilt. A most unusual piece made with a support on the back so that it can be free standing. Backstamp: Caduceus with Bisto England below. Minor wear to the gilt and a little surface scratching, overall excellent condition. Bone china with gilt. A most unusual piece made with a support on the back so that it can be free standing. Backstamp: Caduceus with Bisto England below. Minor wear to the gilt overall excellent condition. Made by the Belgian Boch factory. A series of small dishes, of which this was Number 2. Entitled "Le Cidre" which is printed on the lower rim. Excellent condition. Belgian. There was a series of these small dishes and this was Number 5. "Eau-de-vie" which is printed on the lower rim. Excellent condition. A segment from an hors d'oeuvres set but a very pretty dish on its own. Backstamp: British Scenery Booths Silicon China Made in England. Light crazing with the occasional minor blemish and inside to one corner a small firing fault. A delightful little piece with rural scene to the cover. No backstamp. The base is crazed and is fairly nibbled around the rim. The cover has a very small chip to the rim and a glazing fault to the centre. Overall though lovely! A gorgeous little round box with cover, with a rural cottage scene printed in a steely blue. Backstamp: British Scenery Booths Silicon China England. The base has light crazing with just a little discolouration to the inner rim. The cover has a tiny hairline to the rim and a little discolouration inside, overall a lovely little piece. A lovely dish with the round central section surrounded by 5 prettily shaped sections and all printed in a slightly steely blue. Backstamp: British Scenery Booths Silicon China England. Light all over crazing with a little discolouration which is mainly on the back. This is a most unusual piece made to hold a match box with striking areas exposed. No backstamp. Excellent condition. Fabulous urn, sadly missing its cover, but a lovely piece on its own. Delightful rural scene either side of the body printed in a steely blue. Backstamp: British Scenery Booths Silicon China England. Crazed with some light discolouration which is mainly inside. 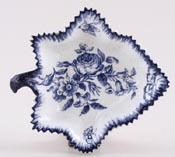 Absolutely gorgeous little dish with delicately embossed veins like a leaf and serrated rim. A little minor crazing but overall excellent condition. 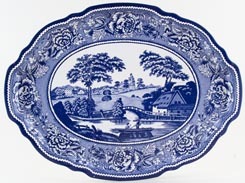 A wonderful set of a round tray and five dishes, with delightful rural scenes printed in a steely blue. Backstamp: British Scenery Booths Silicon China Made in England. The dishes are crazed. Two of them have some discolouration, mainly underneath with one of those also having a chip on the side, only just peeking through when the dish in situ' and the other having a couple of tiny pieces of grit in the glaze. All sounds much worse than it looks, this is a really lovely set. A trefoil dish with three compartments decorated with the same lovely rural scene, and printed in a steely blue. Light crazing otherwise excellent condition. Blue printed backstamp Booths with crown and Silicon China and England. A wonderful set of five dishes in a round tray. There is just a little crazing to a couple of the dishes and the tray shows a few signs of wear but overall in superb condition. Dishes do not sit totally flat in the tray. Blue printed backstamp on all dishes British Scenery Booths Silicon China Made in England. Fabulous set of seven small dishes framed in the original oval wooden tray in mahogany type finish. Backstamp: British Scenery Booths Silicon China Made in England. Two of the dishes have a chip to the rim and there is some wear to the tray otherwise all in excellent condition. What a fabulous dish! The base has one of the lovliest rural scenes in this series. It has tree and well indents and these dishes are sometimes known as steak or ham dishes. It has sime minor fine crazing and there are minor signs of wear to one corner otherwise magnificent with barely a scratch to the surface. The cover again has delightful rural scenes either side with an ornate central handle. Light crazing but otherwise superb. Blue printed Booths Silicon China England. This is a wonderful piece! A large round plate with pierced rim. There is a fabulous rural scene to the centre with floral decoration around the rim, all printed in a steely blue. Superb condition. A fabulous Lazy Susan with four dishes sitting on a revolving wooden stand. Lovely rural scene on the dishes printed in a light steely blue. Backstamp: British Scenery Booths Silicon China England. The stand has a little minor wear, a repair across the middle and a little damage underneath however looks near perfect when the dishes are in situ'. Two dishes have light crazing and one of those has just a little minor discolouration to the rim. Overall excellent condition and a fabulous table centrepiece. With gilt. A gorgeous urn standing on a square plinth with gilt rim and copious amounts of gilt around the floral and bird decoration. Would originally have had a cover. Backstamp: Booths Chelsea Birds. Crazed and a little very minor discolouration inside otherwise excellent condition. With gilt although this shows signs of wear. A lovely three sectioned dish in excellent condition. Blue printed backstamp: Booths Silicon China, Made in England. With gilt. A round serving dish, the base so designed to hold hot water. It would originally have had a cover, but it does still have the original ceramic covered stopper which is usually missing with these dishes. Light crazing and a little minor wear to the gilt otherwise excellent condition. Blue printed backstamp: Booths Silicon China Made in England. With gilt. Fabulous set of 7 dishes set in an oval wooden tray, with the blue Dragon pattern printed on a buff background. Backstamp: Booths Silicon China England Reg No 72427. The dishes have light crazing and a little wear and one dish has a small hairline to the rim. The tray has a few very minor signs of wear, overall all in excellent condition. with gilt. How great to find all seven pieces. Two segments have rim chips, one has just a touch of crazing and there is a little wear to the gilt on some of the dishes. Otherwise this is in superb condition with barely a scratch to the surface. All pieces with Booths Silicon China Made in England. Sadly without a tray. With gilt. Blue printed under the glaze with hand applied enamel colour. Crazed with a little light staining inside the cup otherwise absolutely fine. Blue printed Booths Silicon China England plus printed retailers mark T Goode & Co Ltd London. With gilt. Blue printed under the glaze with hand applied enamel colour. Crazed otherwise absolutely fine. Blue printed Booths Silicon China Made in England plus blue printed retailers mark T Goode & Co Ltd London. With gilt. Superb condition. Blue printed Booths mark (partly missing) plus T Goode & Co Ltd London. With gilt. A fabulous 7 piece hors d'oeuvres set in an oval tray. A little light crazing to a couple of the dishes otherwise superb condition. With gilt. A gorgeous set of six covered custard cups on a pretty tray with pierced side handles. Backstamp: Booths Silicon China England Lowestoft Border and printed in black the retailers Temple & Crook Motcomb St Belgrave Square London Estab 1810 and in script 9184 59 The tray has light all over crazing with a little minor discolouration on the back and a touch of wear to the gilt. 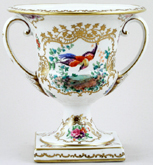 The cups have a touch of crazing mainly to the covers, a little wear to the gilt and a little discolouration to the handles. One cup has a very small manufacturing blemish on the side which has discoloured and another cup has a little very minor damage under the cover and also underneath to the foot rim. Overall a delightful set in very good condition. These four wonderful dishes would have sat on a lazy susan stand to form a superb hors d'oeuvres set. With gilt they are blue printed under the glaze with fabulous hand applied enamel colours. There is just a little minor wear to the gilt otherwise they are all in superb condition. Very attractive small hors d'oeuvres Backstamp: Booths Silicon China Made in England Old Blue Danube Rd No 733824. An unusual set of six rectangular dishes in a solid wooden tray. We cannot be sure the dishes and tray started out life together but they certainly fit together well. The tray does show a few signs of wear. All of the dishes have light crazing and a couple have some very light associated discolouration. Each dish bears the blue printed Booths mark silicon china Made in England, Rd No 733624 and the retailers mark for T Goode & Co Ltd London. Wonderful set of 7 dishes in an oval mahogany type finish tray. Backstamp: Booths Silicon China England. Excellent condition. An old Worcester design sometimes called Pinecone. This is a delightful piece with serrated rim and veined appearance of a leaf. Backstamp: CB. There is a hairline from the rim of approximately 1" otherwise superb condition. Segment from the round five piece hors d'oeuvres set. Backstamp: Booths Silicon China Made in England Real Old Willow. Light crazing otherwise excellent condition.